At 4:49 UTC on 23 July 2008, the Mars Express spacecraft made its closest approach yet to Phobos, the larger of the two moons of Mars, passing at a distance of only 93 km at a relative speed of 3.0 km/s. 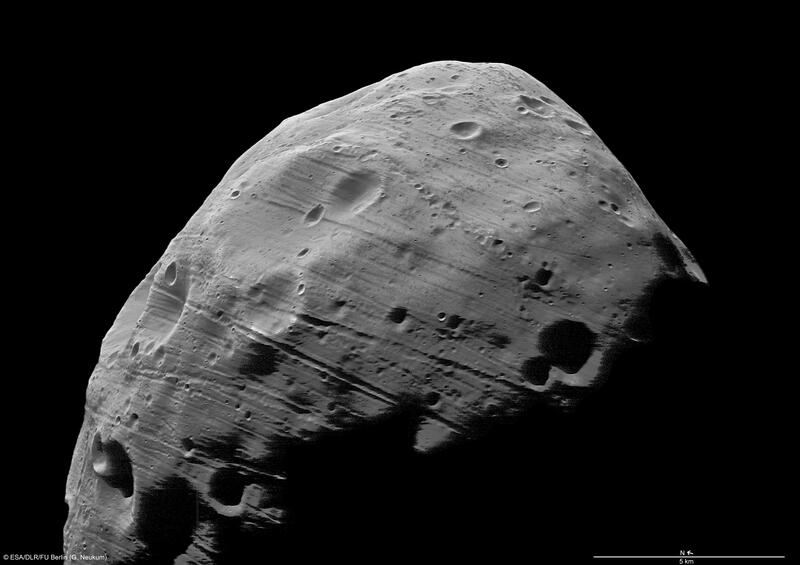 The onboard High Resolution Stereo Camera (HRSC) imaged the irregular 27 km � 22 km � 19 km body, one of the least reflective objects of the Solar System, which is thought to be a captured asteroid or remnant from the planetary formation period. The images, with a best resolution of 3.7 metres/pixel and taken in five channels for stereo and photometric analysis, show detail never seen before. The stereo observations (also at 3.7 m/pixel) are important for photogeologic analysis and the derivation of a digital terrain model, while the extra photometric channels (at 7.4 m/pixel) provide the possibility to characterise the properties of the Phobos regolith at micron to millimetre scales. This new HRSC observation from orbit 5851 is a powerful source for Phobos analysis beyond that achieved earlier by Viking or MOC images, which were either of lower resolution or without stereo, or the recently-acquired NASA MRO HiRISE images which show only the Mars-looking side of the moon, while the new HRSC images cover mostly the side opposite to Mars. The present Mars Express flyby was the closest of a series of five planned during July and August. This is the best full-disk image taken ever! features in the less illuminated part. 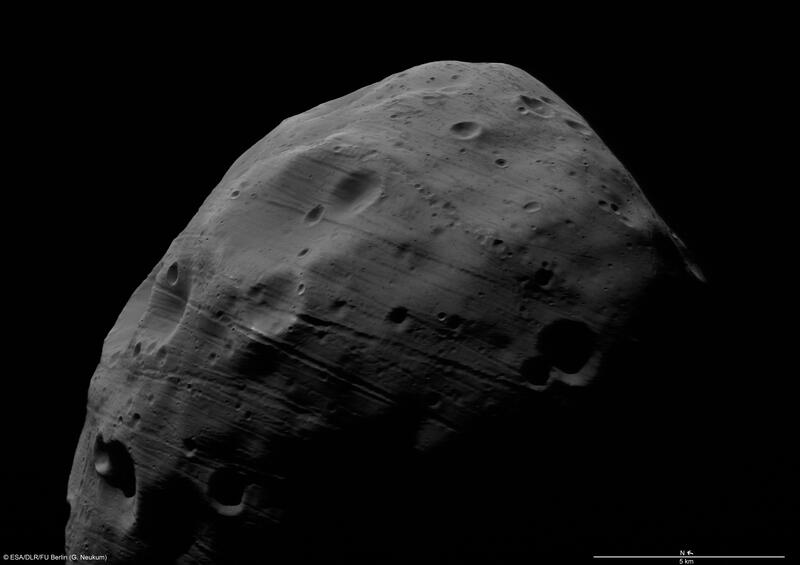 On 23 July 2008 the High Resolution Stereo Camera (HRSC) onboard the ESA spacecraft Mars Express took its highest-resolution image yet of the surface of the moon Phobos. The image data were taken from a distance of 97 km with a spatial resolution of about 3.7 meters/ pixel in orbit 5851. These images have surpassed all previous images from other missions in continuous coverage of the illuminated surface, at a highest spatial resolution of 3.7 meters / pixel. 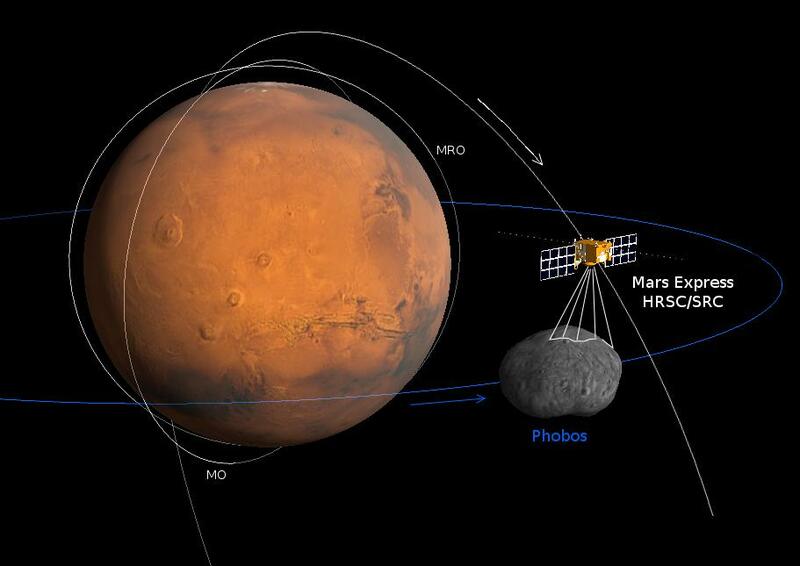 In observing Phobos, Mars Express benefits from its highly elliptical orbit which takes it from a closest Mars approach of 270 km above the surface up to a maximum of 10 000 km distant from the planet's centre, crossing the 9 000 km orbit of the moon. Like our Moon, Phobos always shows the same side to the planet, so it is only by flying outside its orbit that it becomes possible to observe the far side. In 2009, the Russian Federal Space Agency will send a sample return mission called Phobos Grunt (meaning Phobos Soil) to land on the moon at a site on the far side (a region from 5°S to 5°N, 230° to 235°W), a place last seen in the 1970s by the Viking orbiters. This HRSC observation has been much awaited to better assess the selection and more deeply characterise the site. 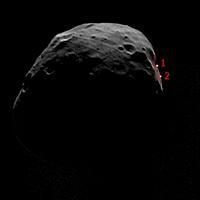 As a consequence, it might be considered to move the landing site slightly to the north. 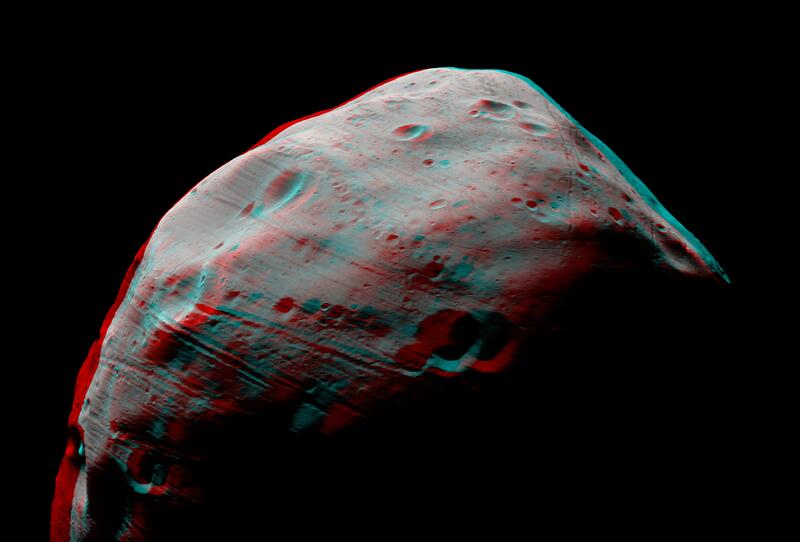 HRSC Stereo Channel 1 (S1) image of Phobos with a best resolution of 3.7 m/pixel. 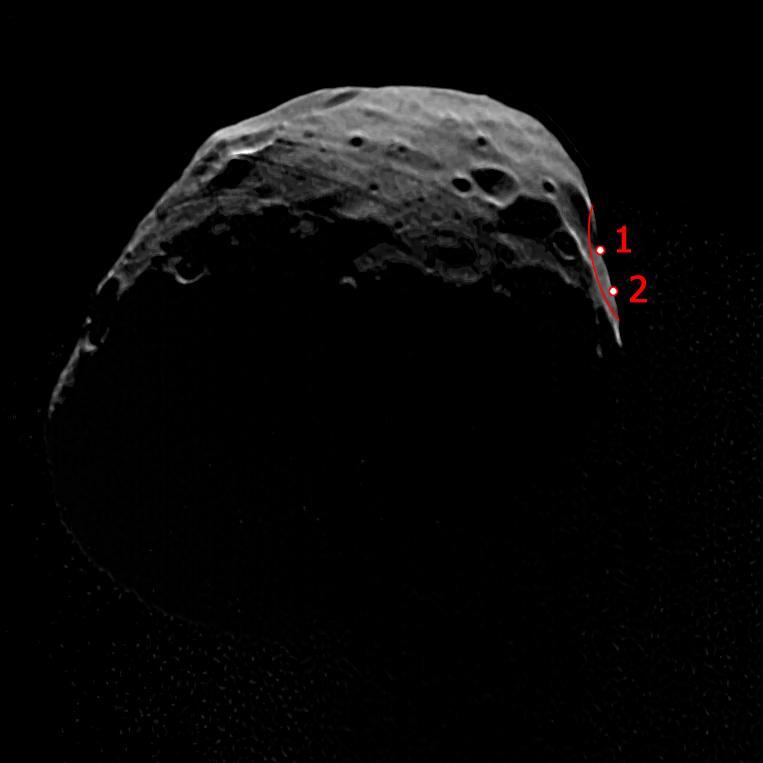 The blown-up portion of the image shows the proposed landing region and sites for the Phobos Grunt spacecraft. Especially well-seen in this image is the moon's remarkable grooved surface: the origin of the grooves is debated - whether they are produced by ejecta thrown up into orbit from impacts into Mars, or the result of the surface regolith slipping into internal fissures in Phobos. In this image, at least two families of grooves with distinct orientations can be seen, and a sinuous crater or pit chain. 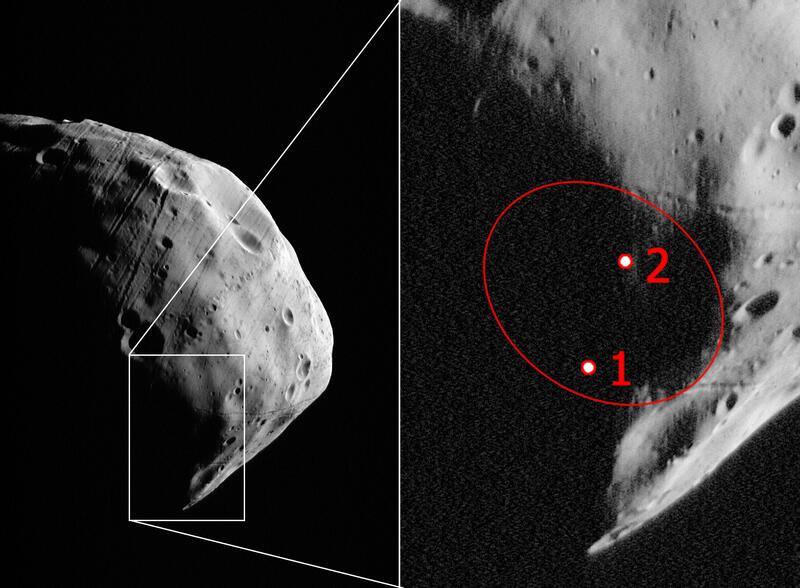 Geometry of the Phobos flyby. Phobos and Mars Express are not to scale. Image: Copyright ESA/DLR/FU Berlin (G. Neukum). The observation made use of a spacecraft slew, a special manoeuvre whereby the body of the spacecraft is rotated against the direction of motion, to slow the speed that the target passes through the view of the camera. This permits us to avoid motion-blur despite the high flyby velocity, whilst maintaining an acceptable exposure time. The HRSC Super Resolution Channel (SRC) also made observations during this close flyby which have a nominal resolution of 90 cm/pixel. It was known that despite the slew there would be residual motion blur in the SCR close-up images (not shown here), but after further processing it is expected to recover much detail. In the days running up to the observation, the primary star-tracker - a navigation device which enables the spacecraft to target its instruments with high accuracy - showed a problem, leaving the spacecraft operating on its secondary system. Concerned that its performance might differ during this critical observation, the team at the European Space Operations Centre in Darmstadt, Germany, worked relentlessly to recover the primary system and were able to switch back successfully two days before the flyby. HRSC Super-resolution channel (SRC) observation from orbit 5850 taken on 22 July 2008 from 4500 km, showing the illuminated edge of the Phobos Grunt landing region at about 41 m/px resolution. The High Resolution Stereo Camera (HRSC) experiment on the ESA Mars Express Mission is led by the Principal Investigator (PI) Prof. Dr. Gerhard Neukum who also designed the camera technically. The science team of the experiment consists of 45 Co-Investigators from 32 institutions and 10 nations. The camera was developed at the German Aerospace Center (DLR) under the leadership of the PI G. Neukum and built in cooperation with industrial partners (EADS Astrium, Lewicki Microelectronic GmbH and Jena-Optronik GmbH). The experiment on Mars Express is operated by the DLR Institute of Planetary Research, through ESA/ESOC. The systematic processing of the HRSC image data is carried out at DLR. The scenes shown here were processed by the PI-group at the Institute for Geosciences of the Freie Universitaet Berlin in cooperation with the German Aerospace Center (DLR), Institute of Planetary Research, Berlin.